If I had my druthers, I would count these down American Top 40 style, from 40 to 1, but it just doesn’t work well in print. 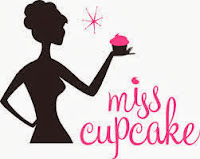 In determining our lists, events are counted, bulk sales are not. Honestly, articles (the, a, an) will be the death of me. We still take them out of our database, like a library classification system. Is this something that other bookstores have stopped doing? I'd love to know. Obviously our online competitors do not do this. I will be following these lists with adult nonfiction and then kids' lists. Thanks to Mike who noticed that not just Herman Koch but Louise Erdrich was on both the hardcover and paperback yearend lists. Monday Event Post--This Thursday is Barbara Pym 101. Barbara Pym 101: A Celebration of Barbara Pym's 101st Birthday. This all started after I read about Barbara Pym's 100th birthday party. I thought we should have some sort of celebration of Barbara Pym too. Unfortunately I had this idea on January 3, the day after her birthday. That said, it wasn't too early to start planning for next year, and the 101st birthday party celebration was born. Jane and I got together and brainstormed. The first thing we noticed was that we weren't selling very much backlist. A previous blog contemplated the various editions, including the often out-of-stock versions from Moyer Bell. A follow-up email from Open Road confirmed that they were going to take over publishing some key Pym titles, and three more followed later in the year from Coffeetown Press. There are still some problems, however. There is no American edition of Quartet in Autumn, which is her only book to be shortlisted for the Booker Prize, now the Man Booker Prize. Pym was restocked, with some staff recs attached, and sales increased substantially. Suddenly it was the fall and we had to start thinking more seriously. A litle tea, a few light refreshments, several speakers, and then folks could come to the stage with their own Pym memories. Jane found a short video that we could show. Anne and Jane offered to make a Barbara Pym reading checklist. I went through The Barbara Pym Cookbook looking for recipes, but realized quickly enough that we'd have to approximate the feel of English snacks, as we were simply not going to serve trifle, railway pudding, and treacle tart. 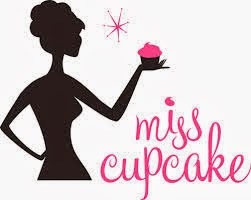 In the end, I asked Megan at Miss Cupcake to bake us lemon and coconut mini cupcakes. Those flavors seemed fifties exotic to me, somehow. I told Jane that I'd call out after-Christmas clearance a "Jumble Sale" to promote the event, but I got cold feet, worrying that folks would think everything came out of my basement. *Someday that will be a post, but I have no idea what book would be the jumping off point to discuss Paddy McAloon. Since I don't really listen to music much anymore, I had no idea that they had a new album this fall, entitled "Crimson/Red." Here's the Mojo review. 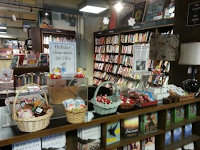 Sunday Bestseller Post--Bookseller Handselling Rivalries, Author Friendships, Comic Book Bar Charts, Plus Worries About One University Press Disappointment. I wanted to flip the hardcovers and paperbacks this week so that Antoine Laurain could wish you a Joyeux Noël! The great year on a book like this is that from my experience, there's a strong second year of sale. By the holidays, folks have started coming in asking for the book without our recommendations, and I think the word of mouth will be strong enough to generate its own sales, as long as we keep it well displayed. I was noting an amusing coincidence regarding Michael Chabon's Telegraph Avenue. I thought sales had lagged behind The Yiddish Policeman's Union, but it turns out they have sold exactly the same number of copies at this Downer Avenue bookstore in hardcover, 94! What's even stranger is that we have also sold exactly 94 copies of the paperback of The Yiddish Policeman's Union. We've got a ways to go with the paperback of Telegraph Avenue, but based on its momentum, it could happen. Note that the paperback looks a lot like the e-book jackets for Chabon's backlist. Interestingly enough, infographics are represented by two books in our top ten. Our sales on Super Graphic have been growing steadily over the holidays and Tim Leong,the design director at Fortune Magazine, uses pie charts, bar graphs, and other infographics to give insights into your favorite comics and graphic novels. Here's his Tumblr site and here is an interview with Leong in a Los Angeles Times blog. It's nice to see the Van Booy-McCann sales rivalry from last summer heat up again for the holidays. It's also nice to see a book from last January like George Saunders get the hardcover holiday pop it deserved. The paperback is due on January 7 with only minor cover changes (the black is now blue, plus an accolades seal). Honestly, being Random House Publishing Group, we thought they'd delay the paperback release. Congrats to W.W. Norton, who had two of our left-field holiday hits, 1227 Quite Interesting Facts to Blow Your Socks Off and Knitting Yarns. It's hard to make trivia books and anthologies stand out as the fields are so crowded, but both of these wound up working very well. Jason also noted that The Autobiography of Mark Twain Volume 2 under-performed volume 1, and we wondered how many stores took very large positions on it. I am impressed that Jason took a comparatively modest number (15), giving us a solid sell through. I would have probably overbought this big time. I'm a little worried about this, as university presses seem under a lot of financial pressure. One of our avid younger Friends of Boswell came in to get excited that the second Ransom Riggs novel, Hollow City, comes out on January 14. She noted that the two authors went to college together. Apparently they are closer than that--according to this piece in Mental Floss from almost two years ago (it takes a while to digest these things), they were in a sketch comedy group together and also both wrote for Mental Floss, of course. In the Journal Sentinel, Jim Higgins looks at The Trip to Echo Spring: On Writers and Drinking, by Olivia Laing. He calls the book "remarkable," noting that "Until Echo Spring, I'd never read a writer who bridged both worlds (writers and recovery) with such intelligence, grace, and thoughtfulness." Originally from the Los Angeles Times and reprinted in our print edtion, Carolyn Kellogg reviews Inside the Dream Palace: The Life and Times of New York's Legendary Chelsea Hotel. "It is the outrageous stories of the Chelsea that makes it so appealing", observes Kellogg. But the chapter may have closed on its craziness with the latest plans for renovation. Perhaps they could move the building to someplace in Brooklyn? From Chris Vognar in the Dallas Morning News comes a review reprinted in the print edition of the Journal Sentinel of James Wolcott's Critical Mass: Four Decades of Essays, Reviews, Hand Grenades, and Hurrahs. Vognar notes that its hard for a critic to not think "I wish I had writtren that sentence" when reading Wolcott. He's "a power hitter who swings for the upper deck"who "argues his case with vigor and wit." The Rebind Detectives Latest Case--Joyce Carol Oates' "The Accursed." My sister Merrill's periodic wish list included a copy of The Accursed, from Joyce Carol Oates. Jason liked this book in hardcover, and we had a pretty respectable sale of 18 copies. Most recently, the book was on The Washington Post best books of 2013 list. But when I grabbed the copy of the book to purchase it and send it off to Arizona, something was off, "A Casual Vacancy" off. By that I mean that the trim size was akin to a hardcover, not a paperback, making me think that the book was a paperback rebind of the hardcover. I've taken a picture to show folks what I'm talking about, comparing the books to several other popular Harper, Perennial, and Morrow titles. One never thinks about this, but it's true. While there's a decent amount of variation in hardcover trim sizes, fiction and narrative nonfiction paperbacks are almost always 5.5 x 8 inches. The Accursed's 6 x 9 inch trim stands out on our new release table as noticeably as Rebecca Solnit's The Unfathomable City at 7 x 12 inches. There are a lot of positives to publishers doing this, most notably a larger typeface and likely a better quality of paper stock. And yet sometimes always seems a bit off when we see this. And it doesn't always mean a disappointment in paperback. I'm pretty sure Tara Conklin's The House Girl didn't do as well as the publisher wanted in hardcover, but the paperback came at standard smaller trim. I'm actually quite happy with our paperback sales for A Casual Vacancy. Usually a book that comes with a lot of flashy backstory has a strong sale in hardcover, but has a much weaker paperback life. But Rowling's run shows that there really were good reads on the novel, enough to give it good word of mouth, despite the media take on the hardcover that this was no Harry Potter. Interestingly enough, our hardcover sale died out on The Cuckoo's Calling, well in advance of the holiday. I wonder if the paperback will say "J.K. Rowling writing as Robert Galbraith" to end the charade. But back to The Accursed. I mentioned that Jason is a fan, and what better place than this post to reprint his recommendation. "Joyce Carol Oates offers up a gothic tale that takes place in early twentieth century Princeton, New Jersey. A curse has been cast over this sleepy town, and our narrator, one M.W. van Dyck II, is witness to the horrors that strike at one particular family. The Accursed is a story with ghosts, demons, and voices telling characters to do bad things; it is also a story that points to the everyday demons of racism and classism. I loved the way Oates wove in historical figures from Mark Twain and Upton Sinclair, to Woodrow Wilson and Grover Cleveland, who is quite possibly my favorite president. Oates will have you digging your fingers into the novel as you near the end, as the tension mounts to heart-pounding heights." It is my Opinion that it’s Amazon’s Fault that you got your present late, no matter where you bought it from. I am tired of one pundit after another blaming UPS for not getting packages to everyone in time for Christmas. It’s my opinion that they are not really analyzing the story. So despite the fact that punditry is all they do and I have a store to run, and a piddling little independent one at that, I thought I’d take time out of my busy day (inventory is just a week away! An email newsletter has to get out! A co-sponsor for Sue Monk Kidd still needs to be signed! Et cetera!) to lay out my humble opinion on how this mess happened. 1. Amazon artificially prices express shipping low, taking a loss on the service*, like they do on many of their items for sale. Let’s look at the cost of us sending one book to my friend Michael in Jamaica Plain (Boston), who bought a few things from us this season. Our cost of sending the book via second-day air was about $21, and that’s not including the mailing bag (50 cents) or the label (about 10 cents) or the labor. A $20 charge is incentive to buy earlier. Even a $10 charge would make you think twice about last-minute shopping. 2. While Amazon still has an overwhelming share of internet purchasing, the problem is not limited to them, as competitors are forced to match prices. 3. Now we know that larger vendors can negotiate this price down, but there are still costs. But if you’re an Amazon prime customer, there’s no additional cost past your annual fee, right? Procrastination is cheaper and easier than ever! 4. A huge spike in demand is caused by artificially low prices. Here is UPS and FedEx’s bind. I already mentioned in the blog that the UPS fleet was filled to capacity, and that they’d rented trucks from various fleets. But where do you get additional last-minute drivers who know the routes like the regulars? I have no clue. 5. Here’s the real rub. It’s a seasonal issue, but this mess may not even happen a year from now, at least at this level. Amazon’s building a million square foot of warehouse 45 minutes from Milwaukee, and have similar building plans all around the country. You’ve got to figure that they are planning to have their own delivery system in place. No, not drones, silly—that was a PR move that coincidentally came the day after Small Business Saturday. By next holiday, we expect they'll have their own fleet of trucks and promise next-or-even-same-day delivery for major metropolitan areas. This fiasco was the equivalent to having your computer crash from too much traffic, or closer to home, too many people showing up at an author event. Somebody's going to be unhappy. How do you solve this problem? Of course the answer is proper pricing. But here’s the problem—UPS can’t force Amazon to charge the correct amount for shipping. This is not an anti-Amazon post. I am just synthesizing the news stories I've heard, adding our first-hand knowledge and a bit of speculation, just like any news pundit. And on a final note, UPS neither picked up nor delivered anything to us December 26. We think they were still catching up on December 24, though when questioned, they said we had nothing scheduled to be delivered. Highly unlikely, as we got 40 packages today. *I should also acknowledge that we also ship at a slight loss. That same UPS shipment to Jamaica Plain via ground costs $12 ($11.50 and 50¢ for the mailer) but we charge $10. As it is, people freak out at the $10, because, as we’ve noted, retailers nowadays eat the cost of shipping to compete with Amazon. **It’s possible that other big retailers will follow suit, harkening back to the days when every large department store had their own delivery fleet. Right now our Quill office supply shipments come by parent-company Staples’ fleet of vans from a warehouse in Beloit. ***That said, Amazon worries about every competitor, large or small. Two years ago an Amazon ad was placed on a bus shelter a block away from Boswell. It was the only such ad I spotted in the metro area. This morning I came in early to do some preliminary redisplay of the store. One of our trees came down, and the holiday ornaments were separated out from the holiday books, as the former are 50% off and the latter are not. 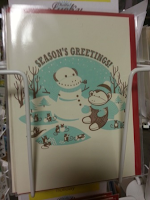 In addition, boxed holiday cards are also 50%. After experimenting with loose card markdowns, we've stopped doing them as we have only a small amount left and even a 50% markdown doesn't really spur sales. I have found that if we have a dead card where the price point might be an issue, it's better to just lower the price than to discount it. I'm not sure what the psychology is there--it might have something to do with perceived value. This is also one of the two times of the year when I clearance other gift items that are not holiday themed. There are some items that simply didn't work, and others that worked really well, but we have very few left, and are not likely to reorder them for a good while. Sometimes one or two items display just fine (journals) while other times, they don't (wind ups, for example). I am particularly sad that my felted trees did not work well, but I think I know what did wrong. When I looked at them in the showroom, they were not put on a tree, attached to a wall, looking almost like garland. In retrospect, that's how we should have displayed them. What an epiphany to have on December 26! Boxed cards are 50% off. Holiday ornaments are 50-75% off. Holiday gift bags and wrap are 50% off. 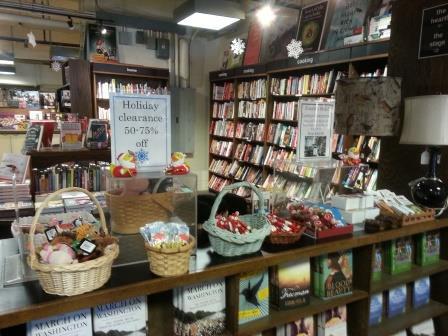 Other clearance items are 50-75% off. For those inquiring, we will not be marking down our calendars until mid-January. Thank you to all the Boswellians for your hard work and good cheer this holiday season. And thank you to all the FOBs (Friends of Boswell) for your support and equally good cheer. I can't think of a season I've worked with less angry or stressed-out faces. And while you know I'm one to say to folks that parking around Boswell is easier than folks expect, where did all of you wind up parking on the 23rd, after eight inches of snow? I have to say, I'm very impressed. Merry Christmas, and thank you again. I do love those Hello Lucky cards. Whether Weather and Other Holiday Ponderings. With the holiday season at its climax (the 26-31 is nothing to sneeze at, a series of decent Saturday-style days in a row), it's time to start musing. 1. This is our first December in several years with a good amount of storms. The last really bad December I can recall is 2008, but you know how memory is. Perhaps I blocked another year out. The thing that was funny about 2013 is that all the storms came on higher-traffic weekend days. Them's the breaks. 2. In the old days, a storm just moved the business to another day, but in the new economy, a good portion just moves online. Even we had an increase in online orders. That said, for the last storm, we did see the business on the Sunday, December 22 storm move to the 21st and 23rd. Those wound up being our two best non-event sales days since we've been open. 3. We knew that home-delivery has increased exponentially in the last few years, as well as quick delivery, but we never expected to get yesterday's UPS shipment in a U Haul truck*. Word on the street is that UPS also completely rented the area's fleet of Penske trucks. 4. What was true on the national level seemed to hit home as well--there was not one must-have item on everyone's gift list. Every time there's a holiday like this, pundits talk about increasing fracturing of nation, the big sort, narrowcasting media, that sort of thing. And then a phenomenon hits, and everyone changes the message. 5. On the local level, the closest we got to a must-have gift was Sanford D'Amato's Good Stock. We kept our stock good through our event (and with close to 200 in sales, we're quite happy, considering how many other events around town were going on for the book), but I probably should have brought in another 50 when I could have. We actually did get a shipment of 10 from a wholesaler on December 24, but I was too frazzled (and tired) to take advantage of social media and get the word out. But yes, if you need Good Stock, or Life After Life or The Flamethrowers, we do have a small quantity available for purchase. I know several folks exchange gifts this weekend, and I'm told that in France, New Year's Eve is the gift-giving time for adults. 6. Part of the issue for us is that many of the mass trends weren't resonating with us. With a democrat in office, conservative politics ruled the day on the bestseller lists, and that tends to skew more chain-store, suburban, and internet, all of which we are not. The exception was Charles Krauthammer's Things that Matter, which had a strong sale with us. It was my thought that these books push other titles that might have sold better for us off the tops of the bestseller list, limiting their exposure. 7. Similarly, I thought that the same thing happened in fiction, with the books that did work for us being a tougher sell in the chain channel and vice versa. While Mitch Albom's The First Phone Call from Heaven was strong nationally, and even had a good presence in the indie bestsellers lists, we just did not have the demand at Boswell, and the same can be said for many of the series thrillers that dominated the lists. Even the commercial authors that work at Boswell, like John Grisham, don't work at that same intense level. And you can try all you want, but The Luminaries is just not going to be the book of the moment at a mass merchant. It would need Oprah, a presidential endorsement, and a television special too. Little, Brown, I've given you a game plan--get cracking! 8. I don't know how it was to other booksellers, but we found that a lot of books didn't take off until the yearend lists came out. It's hard to chase books that don't need chasing. My sympathies to the publishers, though that probably meant even more e-book sales. I'll have more analysis of the sales at year's end, so keep a watch out. *As always, I got sidetracked on the U Haul site and noticed that someone I went to high school with is a bigwig there. For some reason, that was very exciting. We were co-captains of the high school math team. We had team jackets and everything, that we bought from selling bagels made by another member's dad. Long story. Malcolm Gladwell, Underdogs, Word-of-Mouth Phenomena (Note: Phenomenons is Also Acceptable), and The Upcoming Ticketed Event for "David and Goliath" on January 31st. Like so many other folks, I am always intrigued by Malcolm Gladwell's theses. Take his first book, Tipping Point. He took an idea, specifically the idea of a viral phenomenon, and showed how it came together. In the bookstore, we wonder about that sort of thing all the time. Sometimes we now what makes a book take off—an Oprah Book club pick, a presidential recommendation, a national prize. But other times we just say it’s word of mouth. He broke down word of mouth to its components and showed how a product, or even an idea, can take off. Why are some books lovable but hard to sell and others easy to sell? I’d see this firsthand with customers, and second-hand when trying to get booksellers excited about reading books. In the old days I’d write up galleys for booksellers, and when I would get more than a half-dozen requests for a book from an author nobody had previously heard of, I’d get goose bumps. When the story delivered, and I’d start getting back one rec after another, it was time to start selling. Some of the titles caught the eye of big-time sellers, and you’d get an explosion of national sales, like David Wroblewski’s The Story of Edgar Sawtelle. Other times it never seemed to get out of the indie bookstore recommended land and we’d have our own phenomenon with Louise Murphy’s The True Story of Hansel and Gretel or Linda Olsson’s Astrid and Veronika. What would be funny is that there would be other stores selling them just like us, but it wouldn’t be consistent. Using Rebecca Wells’ novel, The Divine Secrets of the Ya Ya Sisterhood as an example, he showed the effect that one bookseller, Mary Gay Shipley of That Bookstore of Blytheville, had on the book’s success. * The Tipping Point continues to be a huge influencer many years later; it’s still on the national bestseller lists. In Blink, Gladwell looked at decision making, and in Outliers, he looked at success. The new book, David and Goliath, is about underdogs. As one of my customers, who asked for the book by the name Underdog said, “I remember the books by the concept, not the title.” However, the book is not just about underdogs, but the advantaged who might be toppled by underdogs. Gladwell looks at strengths that might be covering weaknesses. He makes much use of the inverted-U curve, where throwing more resources to achieve a desired result flattens out and sometimes actually becomes a detriment. And he looks at how changing the rules can change the playing field. And we’ve all seen perceived giants and industry topple when the rules were changed. Jason and I were lucky enough to hear Mr. Gladwell speak at last winter’s bookseller conference in Kansas City. We were both struck by his message, particularly because as independent booksellers, we think of ourselves a bit as underdogs. Now it’s double underdog status—small potatoes in a changing technological market. But interestingly enough, the media’s new story is that the small players can handle the changing market relatively well. Honestly, that’s gross generalization, but we can discuss that another time. We made a proposal for Mr. Gladwell’s fall tour, but alas, it was not to be. But then a great thing happened--Gladwell enjoyed touring so much that he suggested to Little, Brown that they put another one together. Gladwell's sales tend to spike after the holidays, giving David and Goliath another round of attention. So we got the call--Malcolm Gladwell is coming to Milwaukee for David and Goliath: Misfits, Underdogs, Misfits, and the Art of Battling Giants! It’s Friday, January 31, to be precise, for a ticketed event. To make this work, we’ve gotten together with a group of great partners. We’re hosting the event with the UWM Bookstore, whom we worked with on Chuck Palahniuk’s event last October. We secured the Helen Bader Concert Hall at the UWM Zelazo Center on Kenwood Avenue, just off Downer Avenue. Tickets are $32, including all taxes and fees, and are available on the Brown Paper Tickets website. In addition, UWM students, faculty, and staff can buy tickets at the UWM Bookstore. For more info, call them at (414) 229-4201. Our media sponsors are 89.7 Milwaukee Public Radio, Wisconsin Public Radio, and the Business Journal serving Greater Milwaukee. We love working with all three, and they will be great partners at helping get out the word. For this event, there is no gift card option—every attendee will get a copy of David and Goliath. But I assure you that every person attending this event who already has a copy has a list of ten friends who’d love to get one as well. So keep your original and give the autographed one as a gift, or keep the signed copy for yourself and pass along the original. Either way, you’ll get a big thank you. More to come on this event, including things I've learned from reading David and Goliath. *That Bookstore in Blytheville was recently sold to longtime fans of the store, according to Chris Pinker in the Blytheville Courier-News. Boswell Bestsellers for the Week Ending December 21--What More Needs to be Said? Just to note that it's the last few days before Christmas and we're out of stock on a number of hot titles. With the storm, we expect to have a lot of folks calling in to check on titles. I should say up front that we do not have any more copies of Good Stock, for example. The funny thing about the year-end pop on The Flamethrowers (Scribner) is that when it came out, I kept wondering why the book wasn’t selling the way it should, based on its amazing reviews. It just felt like all the good press was spread out, unlike the George Saunders, which went “pop, pop, pop” like a well-oiled machine. I’m so glad that Kushner got a second chance, and that Scribner didn’t rush the paperback. This is the kind of book for which best-of-the-year lists were made. I’ve noticed our good holiday sales for Joshua Bernstein’s The Complete Beer Course, but hadn’t paid much attention previously, only noticing that it seemed similar to the old Windows on the World Complete Wine Course. Indeed, they share a publisher (Sterling, currently for sale by Barnes and Noble if you want to buy it), but had this come out when the wine book was in its heyday, I think it would have bombed. Beer education has come a long way. I am glad to see that while there are many books that come out that I love that are tough sells, there are sometimes books like The President’s Hat (Gallic) and to a lesser extent, Burial Rites (Little, Brown), where I think “I love this and I can also sell it.” I know that other booksellers can sell this too. While there are a number of other stores blowing it out around the country, many more are just letting it sit there. Perhaps, like The Elegance of the Hedgehog, it will pick up steam he second year. That said, Europa's flagship author (is that the right adjective) is definitely Jane Gardam. Having completed releasing the Old Filth trilogy this year, Europa released Gardam's first novel, A Long way from Verona, and that book is from 1971! David Byrne scores a double hit this week with his paperback of How Music Works, and his introduction to Best American Infographics (HMH) helping it jump ahead of Nonrequired Reading to be #2 selling title in the Best American series. And speaking of recs sparking sales, C.J. Hribal’s rec of Maps of the Imagination (Trinity) from Small Business Saturday popped the book onto our bestseller list as as well. And yes, there are three books from the Wisconsin Historical Society Press in our top ten. I hadn’t much paid attention to Maryrose Wood’s The Incorrigible Children of Ashton Place (Balzer and Bray) series before. This series is about three children raised by wolves, in the care of a lord and his governess. In the new volume, the governess takes the children to her alma mater where she is to give a speech, only to find that her employer’s arch-enemy has taken over the school. It seems very much in the vein of A Series of Unfortunate Events. Having not read this series, all I know is that the mystery deepens with this volume. In the Journal Sentinel, Jim Higgins reviews Glass Armonica (Milkweed), the newest collection from UWM poet Rebecca Dunham. Higgins notes that "the title sequence of her new poetry collection...creates words and voices for women, past and present, who've been labeled, diagnosed or written off as hysterics." Glass Armonica won the Lindquist and Vennum Prize, which highlights a work from the Midwest. In addition, Matthew Price reviews Servants, while Bo Emerson talks up Beatles Vs. Stones. These reviews, originally featured in Newsday and the Atlanta Journal Constitution, respetively, are only featured in the print edition of the Journal Sentinel. What Did We Talk About on the Kathleen Dunn Show?